ROS Nutrition regularly runs various competitions on social media platforms includingTwitter, Facebook, Google Plus and Linked In. 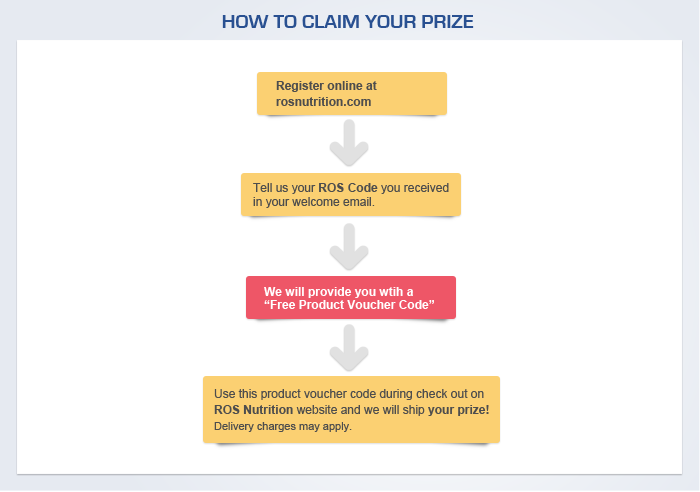 All ROS social media contests are sponsored by the ROS Nutrition Group Ltd. By participating in the contest, each entrant agrees to abide by all the competition rules laid out by ROS, including eligibility requirements, and understands that the results of the contest, as determined by the sponsor and its agents, are final in all respects. The contest is subject to all local laws and regulations and is void where prohibited by law. In order for the competition winners to redeem their prizes, they are required to register online at rosnutrition.com. Winners will be requested to provide their unique ROS code (provided in a welcome email upon registration) to claim their prize. Prizes are claimed using a “Free Product Voucher Code' which only applies to online orders. Delivery charges may apply to the products won by contest winners and the cost of the same is to be borne by the winners. The Contest is open to legal residents of their respective countries where not prohibited by law, who are eighteen (18) years of age or older at the time of entry who have Internet access and a valid e-mail account prior to the beginning of the Contest Period. The sponsor has the right to verify the eligibility of each entrant. Terms and conditions may apply. Incidental expenses and all other costs and expenses which are not specifically listed as part of a prize in these Official Rules and which may be associated with the award, acceptance, receipt and use of all or any portion of the awarded prize are solely the responsibility of the respective prize winner. All state and local taxes associated with the receipt or use of any prize is solely the responsibility of the winner. By participating, each entrant grants the Sponsor permission to use his/her name, likeness or comments for publicity purposes without payment of additional consideration, except where prohibited by law. By entering the contests, each entrant agrees to indemnify, release and hold harmless sponsor and its parent, affiliate and subsidiary companies, the Facebook, Twitter, Google Plus or Linked In platform, administrator, advertising and promotional agencies, and all their respective officers, directors, employees, representatives and agents from any liability, damages, losses or injury resulting in whole or in part, directly or indirectly, from that entrant’s participation in the contests and the acceptance, use or misuse of any prize that may be won. Sponsor and its parent, affiliate and subsidiary companies do not make any warranties, express or implied, as to the condition, fitness or merchantability of the prize. Sponsor and its parents, subsidiaries, affiliates, advertising and promotional agencies, and all their respective officers, directors, employees, representatives and agents disclaim any liability for damage to any computer system resulting from access to or the download of information or materials connected with the contests. This promotion is in no way sponsored, endorsed or administered by, or associated with Facebook, Twitter, Google Plus or Linked In. Any questions, comments or complaints regarding the promotion will be directed to Sponsor i.e. ROS Nutrition Group, and not Facebook, Twitter, Google Plus or Linked In.